I was among the first to arrive in Asagiseyit on a Sunday morning in late August. The long-sleeve shirt I wore to shield my skin from the summer sun proved insufficient for the surprisingly deep cold that filled the valley before dawn. I had come to Asagiseyit, a village of 355 people on the dusty banks of the Menderes River, for the show. Each year, this remote hamlet, located 150 miles east of the Aegean Sea and another 150 north of the Mediterranean, plays host to one of southwestern Turkey’s strangest, oldest, and most anticipated events, the Shepherd Games. Local legend has it that more than eight centuries ago, in the year 1173, the daughter of the wealthy, landowning village chief fell in love with a poor shepherd boy. The girl’s father was less than amused by their declarations of love, but because of his daughter’s persistence, laid down a condition on which he would give his daughter to the poor nomad. If after three days of feeding salt to the sheep, the herdsman could lead his flock to cross the river without stopping to drink he would consent. The love-struck youth despaired, but the sheep, perceiving the shepherd’s need, came together and crossed the river, no problem. The father, of course, went back on his word and refused to grant his blessing to the marriage. The girl, as the story has it, fell ill and died under the weight of lost love. The shepherd forsook the village with a broken heart. To commemorate the unrewarded success of their fellow herdsman, local sheep herders (and there are still swarms of local shepherds in this swath of Anatolia) have been gathering for the past 839 years to attempt the feat for themselves. The games are typically held the last weekend of August, when the weather and the typically brisk water is warm. 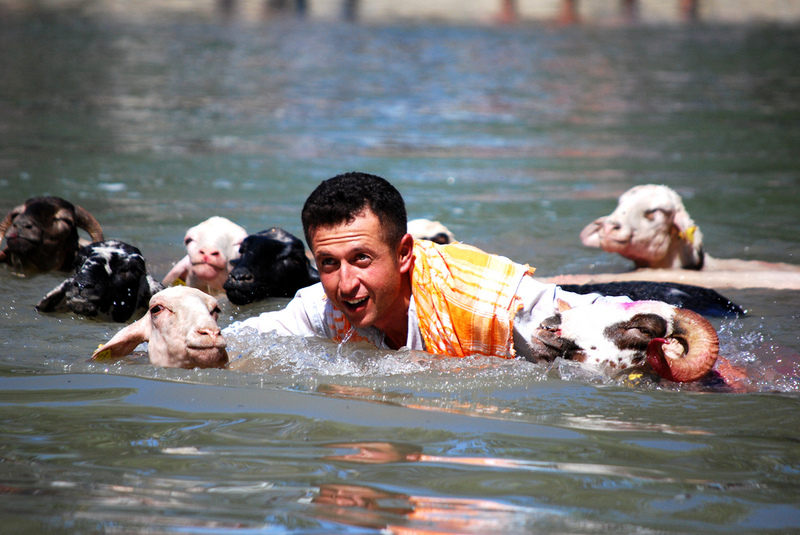 In the past shepherds entered entire flocks into competition, but because some were bringing hundreds of sheep and taking a half hour to get the animals into the water, the organizers have in recent years capped the number at thirty. The Shepherd Games draw nearly 5,000 people every year. They travel from up to 250 miles away. Due to the event’s provenance, I expected to feel as if I were stepping back in time, but at the start of the day there were more photographers present than shepherds. A television station had arrived at the scene equipped with a twenty-foot telescopic camera rod to capture the highlights of the action for the evening news. Eventually, vendors from neighboring towns hawking tea and coffee emerged from tents and vehicles, in which they had passed the chilly night, and fired up their industrial size gas-burning tea and coffee pots. While warming my hands around a cup of scalding instant coffee, I heard, finally, the unmistakable clang of sheep bells. Across the bridge from me, rounding the last bend in the road on the other side of the river, a shepherd was guiding his flock to the edge of the Menderes, the site of the competition. Of the thirty shepherds who travel from within a thirty-mile radius to participate, only a handful of them arrived like this, the old-fashioned way, steering their livestock on foot through the hills and down into the valley. Most of the sheep came in trailers pulled by worn-out pick-up trucks, or the family tractor. The flock squeezed across the narrow bridge and down a gentle embankment to find some pasture a few hundred yards away. As other shepherds arrived, they set up temporary pens to contain their miniature flocks until the show commenced. The next few hours passed uneventfully, with spectators filling the bridge above and the banks around the river. The sun’s rays found the bottom of the valley, and the cold quickly gave way to the warmth of the day. By mid-morning, an Ottoman-style military band was playing a traditional war march to announce the beginning of the festivities. The governor of the province and other dignitaries, wearing spruced suits and ties, found their places under the shade of the covered bleachers. A few local farmers who hadn’t been invited to sit in the bleachers drove their tractors into the shallows downstream and slowly made their way to the bridge, to watch from the shade there. Across the water a five-man jury had taken its place under a tent, near the spot where the shepherds would try to convince their flocks to trail them into the current. The judges would watch the proceedings carefully. They were there to superintend. They would review video when necessary to ensure that none of the shepherds physically pulled their sheep into the water. They would measure the time between the moment when the shepherd entered the river and the moment the first sheep followed suit. The prizes were chunks of gold, with the first place award valued at just over $400. A few military police officers were guarding the bank around the judges’ tent, which was off limits to everyone save photographers donning expensive-looking cameras. The master of ceremonies welcomed everyone, praised the tradition we had gathered to observe, and explained the rules. Then, about 100 yards away, the first shepherd crested the hill with his flock. At a brisk pace he descended the dirt road toward the river. His sheep followed him to the end of what looked like a primitive boat-ramp. But in a matter of seconds, the excitement gave way to distress. The shepherd glared at his animals, all of which had stopped cold at the water’s edge. Standing there in the middle of the current, he began singing to them. He whistled. When the sheep didn’t move, he turned to the judges and blamed the discombobulation of his herd on the military band, which was still playing, loudly. The judges ordered the band to desist. It quickly became clear that the band was not the issue. Time and again the failed scene repeated. Wet, frustrated shepherds trudged out of the water to herd their dry flocks back up the hill. In the hot August sun, I began to wonder why this event attracted such a crowd year after year? 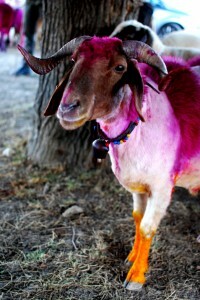 The various activities surrounding the games – live Turkish folk-music, grilled sandwiches, roasted corn, a beauty contest for the giant English mastiffs that serve as sheep dogs – created the feel of a rural county fair, but you could find those every weekend in the summer in southwestern Turkey. Was this business with the sheep and the river impossible? Were the participants addicted to failure? Success was beginning to seem as dubious as the legend that had spawned the kerfuffle. I wondered if anyone ever actually made it across. It wasn’t long before another shepherd descended the hill. There was something different about this one, about the confident gate with which he carried himself, about his rapport and connection with his flock. He entered the water without hesitation and lumbered several steps before glancing back. The head sheep, easily distinguished by the deep purples, striking reds, and vivid yellows painted all over his body, inched to the water’s edge and looked up, adoringly, at the shepherd. Arif, a young shepherd who competes in the games, explained to me later that the head sheep is the one that is always first to listen to his master’s voice. In Turkish this animal is also called the “hand sheep” because when the shepherd lies down to sleep under the open air with his flock, he ties a string from his hand to the sheep’s neck. If danger approaches, or the flock becomes restless, the head sheep rouses the shepherd. Whether he whistles or sings, plays a flute, or beckons with his voice, the head sheep is the one who responds to his master’s call. He won’t follow a stranger, but he knows the shepherd’s voice. The shepherd is most concerned with building a relationship of trust with this sheep because where it goes the others will follow. On this Sunday afternoon in late August, the head sheep, polychromatic and attentive, waited patiently on the bank for instruction from his wading shepherd. Maybe the man whistled, maybe the man sang, maybe he said nothing at all. Whatever he did did the trick. One moment the sheep was standing still, the next he was leaping, a blurred burst of color arching into the gray-green current. The rest of the flock did indeed follow. They creased the Menderes in a series of muted splashes. And the shepherd? He stayed put until the head sheep came near. Only then did the man turn in the water. And when he turned, his eyes were fixed, fixed like one imagines the eyes of the poor lovelorn shepherd from centuries before had been fixed — fixed, that is, upon the farther shore, the shore onto which he would lead his dripping rabble to safety in what was the first clear victory of the day. Andy Owens is a contributing writer for EthnoTraveler.